Awesome news!!! In addition to the partnerships with Refractive Software (makers of Octane Render) and the development team behind the Brigade path tracer (which I blogged about here), OTOY now announced a partnership with Autodesk to integrate Octane Render into the viewport of Autodesk's 3D Studio Max 2012 and stream real-time path traced visuals for animations, movies and games from remote GPU clusters in the cloud to the client. Real-time GPU path tracing is big business, and the best part is that it's going to bring game graphics up to ultrarealistic levels in the not too distant future. OTOY's 3D rendering tools, including Octane Render™ and Brigade™, are the premier rendering solutions for next generation 'path traced' games and films. 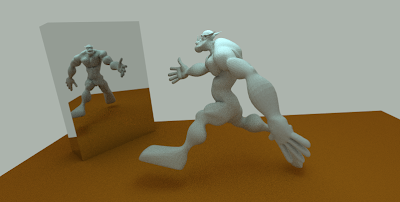 Path tracing significantly reduces the cost and complexity of high quality rendering by automatically generating effects traditionally handled through manual post processing – including spectral rainbows, lens flares, unbiased motion blur and depth of field. “A year ago, path tracing was considered too expensive to be used even in high-end Hollywood blockbusters. Today, thanks to advances in GPU rendering, OTOY is bringing real time path-tracing technology to millions of artists by leveraging GPU hardware that costs only a few hundred dollars. This is a game-changer on any budget,” said Jules Urbach, CEO of OTOY. “Autodesk is the leader in 3D design software for film and video game production. We are incredibly excited about our partnership and proud to be bringing their industry leading tools to an ever-expanding market through our cloud solutions,” said Alissa Grainger, President of OTOY. 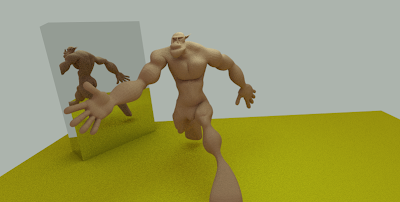 It’s one of the first animations that uses Arnold, the Monte Carlo path tracing based production renderer developed by Marcos Fajardo, that is currently taking Hollywood VFX by storm: it was used in e.g. Cloudy with a Chance of Meatballs, 2012, Alice in Wonderland and the Assassin’s Creed: Brotherhood and Revelations CG trailers and is giving PRMan and mental ray a run for their money (probably making them obsolete soon, mainly because of ease of use and huge artist time savings). The animation shows a very lifelike clay figure coming to life. Despite the simplicity of the scene, the whole looks very believable thanks to physically accurate global illumination and materials and an extensive use of depth-of-field and camera shake. 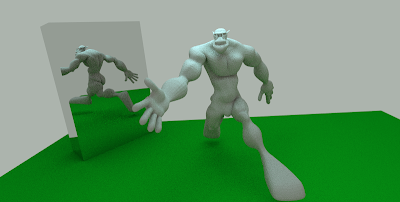 In an attempt to reproduce that particular scene, I’ve used the animated Ogre model from a ray tracing demo developed by Javor Kalojanov which can be found at http://javor.tech.officelive.com/tmp.aspx. 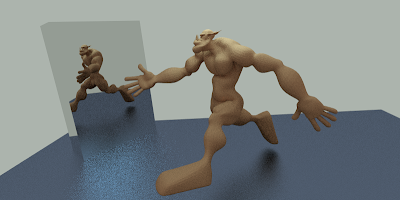 The Ogre model (which was created by William Vaughan) consists of 50,855 triangles and was also used in the excellent paper “Two-level grids for ray tracing on GPUs” by Javor Kalojanov and Philipp Slusallek (really great people btw, whom I've had the pleasure to meet in person recently. The conversations I've had with them inspired me to finally try triangles as primitive for my real-time path tracing experiments (instead of just spheres), which led to this Ogre demo. To my surprise, triangle meshes are not that much slower to intersect compared to spheres. I think this is due to the fact that the cost of primitive intersection is becoming increasingly smaller compared to the cost of shading). Path tracing is performed entirely on the GPU, in this case a GTS 450 (a low-end GPU by today’s standards). The framerate of the walk animation is about 4 fps max on my card but should be around 15-20 fps on a GTX 580. 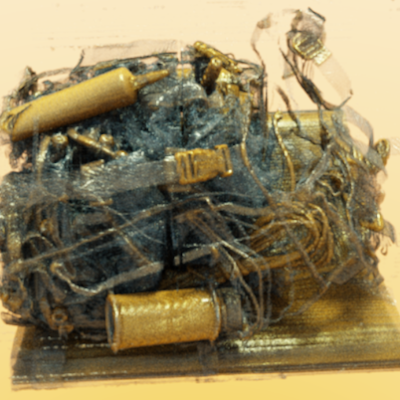 The image converges extremely fast to a very high quality result (in about 1-2 seconds). The movement of the Ogre (translation, rotation, animation) is actually much more fluid in real life without Fraps, the overhead of the video capturing software almost halfs performance. If you’re interested in trying this scene out yourself, send me an e-mail at sam [dot] lapere [at] live [dot] be. A CUDA enabled GPU is required (minimum compute capability 1.1). I’m planning to build a (very) simple game with this tech. The possibilities are really endless. We're on the cusp of having truly photorealistic games. Another experiment: no spheres this time, but a real-time animated triangle mesh (the hand is from the Utah 3D Animation Repository, a textured mesh containing 15,855 triangles). 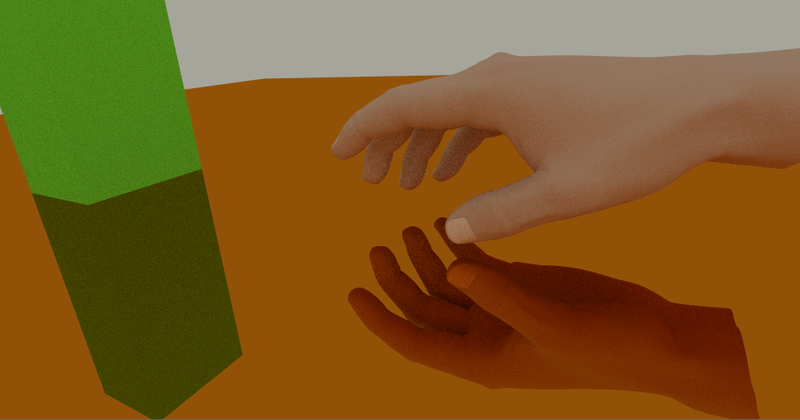 The goal was to create a simple animated scene and achieve a look as close to photorealism as possible with completely dynamic, physically accurate global illumination in real-time using path tracing. The results for filtered images using only 8 input samples per pixel are extremely impressive. "We have fully working and VERY fast SSS ready for release in the next test version. 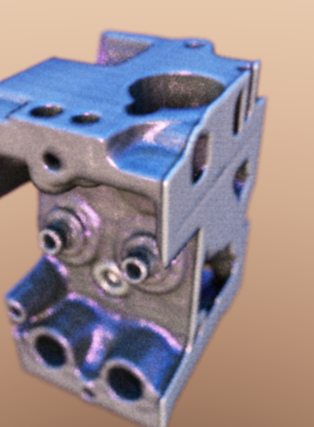 It renders about as fast (a tiny bit slower) as a glossy specular material. And, it's unbiased/bruteforce SSS, eg no bias introducing photon grids or other precomputed approximations. This is the prime new feature in the next test release, along with instancing support and FAST voxelisation, and another suprise feature, aswell as the soon to be publically released first of a series of new products, OctaneRender for 3DS Max." Some screenshots with the new SSS method can be seen in this thread. "Bidirectional pathtracing (and PMC) should make renders like this one converge MUCH faster and bidirectional pathtracing + PMC is something we will be starting work on next, after 2.5 is out. PMC + bidirectional will be ideal, it will be as efficient as the popular standard in CPU based unbiased engines (MLT+bidir), and this combined with the power of GPUs should really take things to a new level." 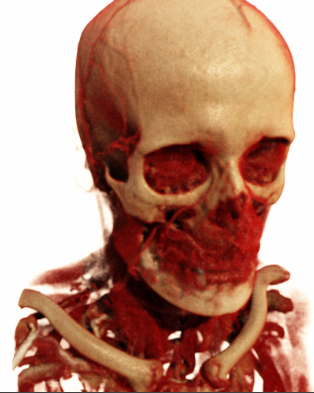 The video shows an eerily realistic representation of a person scanned with CT (computed tomography), where anatomical layers of skin, muscle, cartilage, connective tissue and bone can be peeled away and rendered with photorealistic quality global illumination in real-time. This could be an extremely useful training tool for medical students and aspiring surgeons. 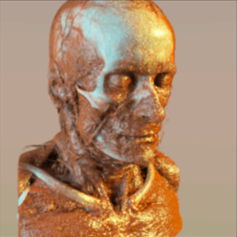 The physically based photorealistic 3D renders of skull, bones and soft tissue could also benefit radiologists in diagnostic decision making. Most medical volume rendering software uses ray casting, which is fast but provides very unrealistic looking lighting. With volumetric path tracing finally being feasible in real-time thanks to the GPU, this will hopefully change soon. I think we will see an implementation of real-time path traced sparse voxel octrees pop up sometime in the very near future.